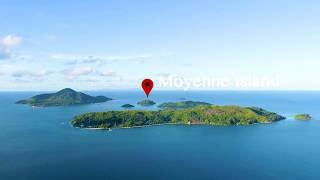 Departing from Victoria, just 5 km (3 miles) off the coast of Mahé is the oldest marine reserve in the Seychelles, named for its largest island, Sainte Anne. Besides this island and the surrounding lagoon, the park is home to Moyenne Island, Round Island, Long Island, Cerf Island, Ile Cachée, and shallow ocean waters. In total, the park covers 14.43 km² (5.6 sq. miles), and consists mostly of coral reef. The area of the park's six islands, which themselves count among the so-called 'Inner Islands' of the Seychelles, being made up of the traditional mix of volcanic rock and granite, is just 3.8 km² (1.5 sq. miles). 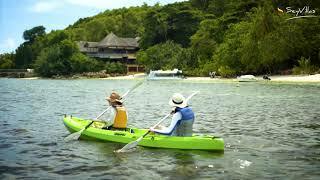 Around 40,000 tourists visit the park every year, which equates to approximately one third of all Seychelles visitors. By employing guides, boat operators etc. in the park, tourists are not only contributing to the GDP of the Seychelles, but also financing protection efforts in the park. The Marine National Park was established in the municipality of Mont Fleuri in 1973, and its original objectives were rather different from today. At the time, coral rock was used to build houses, while sea turtles were eaten as a delicacy and fishermen used the abundance of fish in the shallow waters to improve their hauls, so much so that there was a threat of over-fishing. Increasingly, marine biodiversity was threatened, especially by increased tourism. The importance of tourism to the country's economy however meant that a solution had to be found that protected the region and the nation's economy at the same time. The Marine Park Authority, established in 1994, monitors conservation laws, and divided the ocean into zones using a system of buoys, designating restricted or limited-access areas. These included defined diving spots where you can sail glass-bottom boats or snorkel. There are also regions where picnics and non-motorised watersports (swimming or windsurfing) can be practised. Tourists flock to the park for its extensive flora and fauna, as well as its excellent diving and snorkelling conditions. With a little luck, visitors can spot eagle rays, pipefish, sea turtles, and sometimes even bottlenose dolphins. Despite its proximity to Victoria and the port, the park's safeguards have ensured that the biodiversity of the underwater world here is greater than at many other places in the Seychelles. The park's best snorkelling spots, in the Sainte Anne Channel between Sainte Anne and Moyenne, are home to over 150 species of marine life, while the reefs here are vivid and colourful. Besides the reefs themselves, you can also see flat sections just below the water surface, including granite rocks with coral growing on them, seaweed beds, sandy plains, and other interesting underwater formations. The use of land on the park's six islands is geared towards sustainable tourism, with manageable, sustainable hotels and restaurants. All of the Seychelles' Marine National Parks are open daily, but all non-residents of the Seychelles must be in possession of a valid ticket, bought at a retail outlet, to be allowed in. Due to its enormous significance for the natural and cultural heritage of the Seychelles, it is really important that tourists leave nothing behind them except for footprints, and merely take photos of the park by which to remember it, rather than any other souvenirs.